This example computes the excess event risk fraction that is attributable to a specific chemical exposure for workers in a factory. Suppose that the Factory data set contains the stratum-specific event information for exposure to a specific chemical agent. The variable Age is the grouping variable that forms the strata. The variables Event_E and Count_E indicate the number of events and number of workers for workers with the specific chemical exposure, respectively. The variables Event_NE and Count_NE indicate the number of events and number of workers for workers without the specific chemical exposure, respectively. The "Standardization Information" table in Output 107.3.1 displays the standardization information. The STATS option in the STRATA statement requests that the "Indirectly Standardized Strata Statistics" table in Output 107.3.2 display the strata information and the expected number of events at each stratum. 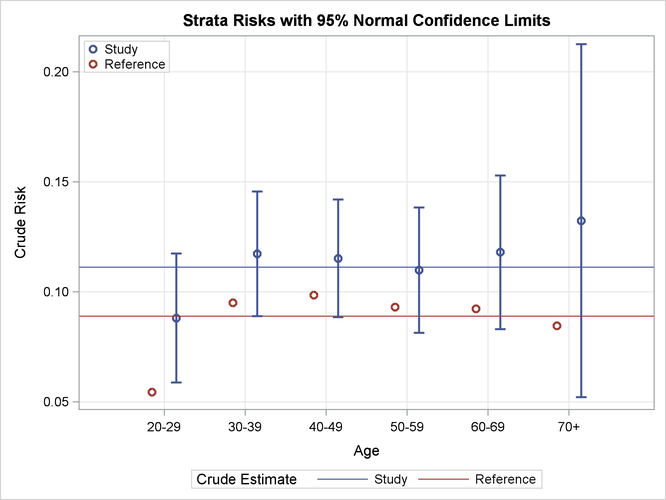 The Expected Events column shows the expected numbers of events when the stratum-specific risks in the reference data set are applied to the corresponding numbers of workers in the study data set. The METHOD=INDIRECT option requests that the "Standardized Morbidity/Mortality Ratio" table in Output 107.3.4 display the SMR, its confidence limits, and the test for the null hypothesis . The "Standardized Morbidity/Mortality Ratio" table shows that SMR=1.259, the confidence limits do not contain the null value SMR=1, and the null hypothesis of SMR=1 is rejected at level from the normal test. The "Indirectly Standardized Risk Estimates" table in Output 107.3.5 displays the standardized risks and related statistics. The attributable risk fraction 0.206 indicates that of all events in the chemical exposure group are attributed to the chemical exposure, and the population attributable risk fraction 0.028 indicates that about of all events in the total population are attributed to the chemical exposure. The Attributable fraction can also be computed by using Mantel-Haenszel method. Suppose that the Factory1 data set contains the stratum-specific event information for exposure to a specific chemical agent. The variable Age is the grouping variable that forms the strata, and the variable Exposure identifies workers with chemical exposure. The variables Event and Count indicate the number of events and number of workers, respectively. The GROUP=EXPOSURE option specifies the variable Exposure, whose values identify the various populations. The ORDER= suboption specifies the order in which the values of Exposure are to be displayed, and the EXPOSED= option identifies the exposed group in the derivation of the attributable fraction. The "Standardization Information" table in Output 107.3.7 displays the standardization information. The "Mantel-Haenszel Standardized Risk Estimates" table in Output 107.3.8 displays the Mantel-Haenszel standardized risks and related statistics. The EFFECT option requests that the "Risk Effect Estimates" table display the risk ratio statistic for the two directly standardized risks, as shown in Output 107.3.9. Similar to the results of using the SMR estimates, the attributable risk fraction (0.205) indicates that of all events in the chemical exposure group are attributed to the chemical exposure, and the population attributable risk fraction (0.028) indicates that about of all events in the total population are attributed to the chemical exposure.